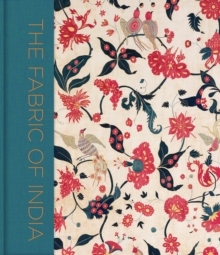 This is the first truly comprehensive book on Indian textiles, featuring stunning examples from all over the subcontinent. Lavishly illustrated, it begins with an in-depth exploration of the different materials, techniques and dyeing processes used in the creation of these sumptuous fabrics before exploring the central importance of cloth to Indian life and culture, from ancient times right up to the present day. Interspersed throughout are key-object spreads focusing on 20 objects of world-historical importance, including a Kashmir map shawl, Tipu Sultan's tent, and an Abraham and Thakore sari. While many people are familiar with some aspects of South Asian textiles - Mughal velvets, western-market chintzes, or rural embroideries, for example - this book aims to surprise, inspire, delight, and inform readers with an extraordinary range of material, much of which will be new. As well as presenting some great historical masterpieces, the importance and variety of the basic fibres - silk, cotton, wool - from which Indian textiles are traditionally made is emphasized, and the remarkable techniques of weaving, printing, dyeing and embroidery that have made them prized across the world right up to the present day are illustrated in specially taken photographs.